Sit in the charming windowseat overlooking maple-shaded Main Street. Furnished with cherry twin beds and dresser. We found the pink tinted mirror for this bedroom in an antique store in the small community of Dale. One of our guests told us that this mirror was probably from a cruise ship during the art-deco period in 1920s. He said they often tinted the mirrors pink so the guests would appear healthier that they felt from sea-sickness. Amid vintage florals the canopy bed overlooks a raised bed herb garden. The bed and steps leading up into bed were built by a local carpenter Jesse Sannes, a relative and friend of my father. Lampshades and throughout house were handmade by Addy Garner, who with her husband sold us almost all of the antique lighting in the Inn. With a delightful potpourri of eclectic furnishings, this room overlooks the perennial garden and fountain. This room has a private full bath across hall, separated from other rooms by a door in the hall. This was previously the maids room and has a separate access to the back stairway. This room and the North Room have swing drapes from the early 1900's provided shade and privacy when closed. The Inn was built in 1900 by P.J. Christofferson, M.D. He and his brother A.M. Christofferson built the first hospital in Waupaca, which is located behind the Inn and is now a group home. P.J. and his wife Adelle owned the home until Adelle passed away. It was then sold to a local chiropractor, Dr. Smith, who built the small one story building that sits behind the Inn amidst the gardens. The families of Ross and Van Ornam owned it prior to selling to Ms. Oerter in 1994. 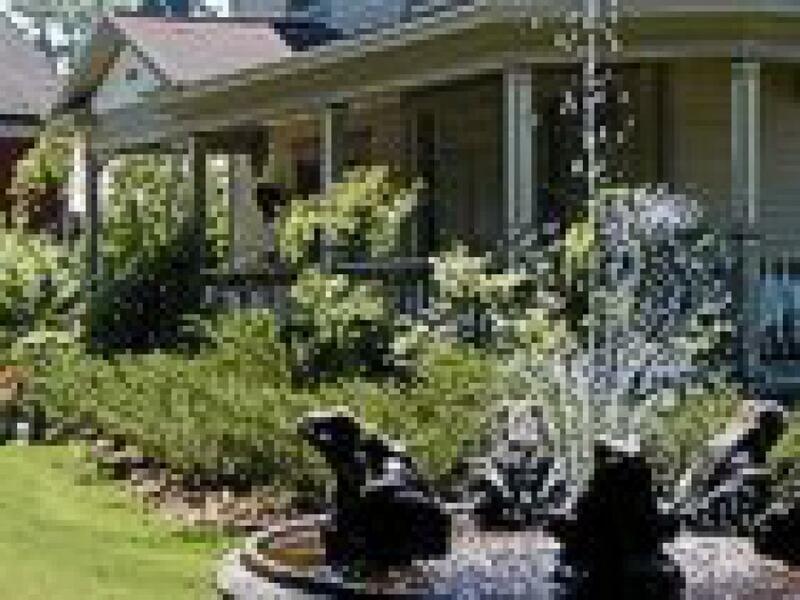 The house was converted to a bed and breakfast and after extensive updating and adding bathrooms to all the rooms, the Green Fountain was opened in the fall of 1995. Landscaping, gardens, fountain and statuary were added to unite all three properties. In 2002, the Back Door Bakery was opened followed by the Secret Garden Café where bakery and lunches were served in and outdoors. The Café remains opened all year for lunches and dinners are available now on Friday and Saturday nights. The Inn is available to host small weddings, showers, anniversary and birthday parties plus other intimate gatherings.